A premium hard folding tonneau cover with a matte black finish, TPO dent resistant panels, and snap-on seals for the ultimate in weather resitance. OEM Matte Finish The Solid Fold 2.0 features a black matte finish and textured, powder coated aluminum frames and hinges for extra wear resistance and protection. Lightweight Lightweight, 1 inch thick panels made of automotive grade thermoplastic skins with polypropylene core for the ultimate in dent resistance. They're cool to touch on hot days and won't fade or break down under heat load. Ultimate Weather Protection Hard polymer rubber corners, hinge caps and snap-on seals provide the most weather resistant hard folding cover on the market! Convenient Cargo Storage Stow your cargo under the cover, or simply open it up to carry taller items or 5th wheel hitch use. Quick and Easy Install Fully assembled out of the box and easily installs in seconds without tools or side rails by using the front T-handles/SafetyKlamps. Solid Fold 2.0 - The Next Generation of Extang's Solid Fold! 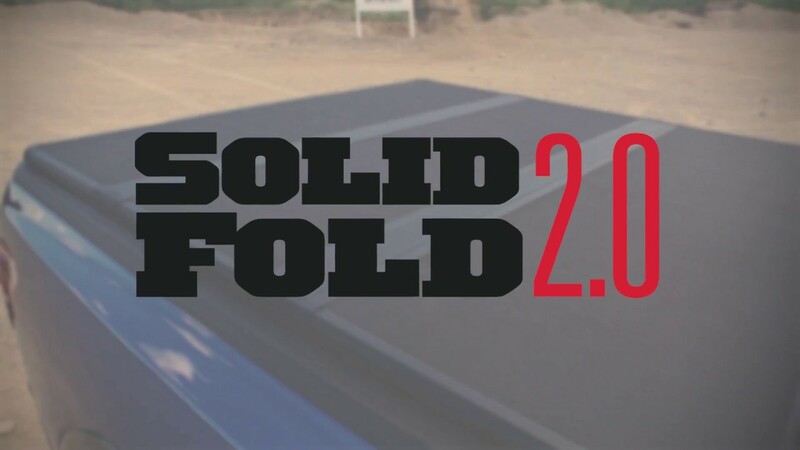 The Solid Fold 2.0 is a redesigned, re-engineered version of our most popular cover, the Solid Fold. Now made with TPO dent resistant panels, it's cooler to the touch on hot days, and integrated snap on seals make it the most weather resistant folding cover on the market, sure to withstand the harshest of weather conditions. The new textured matte finish and powder-coated frame and hinges give the 2.0 an OEM look and a soft feel. All of the versatile elements of the original Solid Fold remain - it comes fully assembled out of the box, installs in seconds and folds using its three panels and aluminum hinges. The Extang Solid Fold 2.0 tonneau cover can be installed on your pickup in minutes. It has an easy clamp on installation. Each product comes with easy to understand vehicle specific installation instructions. WARRANTY DURATION: The Extang Solid Fold 2.0 carries a three-year warranty against defective materials or workmanship on all tonneau rails, aluminum components, clamps, bows, hardware. WARRANTY CONDITIONS: This warranty is against defective materials or workmanship. The warranty is void if the product has been damaged by accident, unreasonable use, neglect, improper service/installation/removal, modifications, acts of God, normal wear and tear or other causes not arising out of defective materials or workmanship. Consequential and incidental damages are not covered under this warranty. THE FOLLOWING CONDITIONS WILL ALSO VOID THE WARRANTY: Wind whip damage — Tarps must be secured at all points when vehicle is in motion. An unsecured tarp will flap, resulting in damage to the fabric. Improper cleaning — It is recommended to use the tested and approved Extang Tonno Tonic or clean with soap and water only. Do not use vinyl conditioners (i.e. Armor All) because they will shrink the vinyl. Overloading of cargo — Cargo should not touch the tonneau at any point. Protrusions in the tarp will stress the fabric. Cargo may shift while traveling and cause it to push against the fabric or panels and damage it. Driving with panels open or improperly secured on all folding tonneaus — Prior to vehicle operation, clamps must be tightly secured so that clamp lips tightly grip the inner bedside metal surface. Open position: Tonneau must be completely folded and secured with BOTH buckles. Closed position: Tonneau must be completely flat and secured at all 4 clamps. Opening panels without removal of debris on all folding tonneaus — Top of tonneau MUST be free of foreign material including snow and ice before opening panels or severe damage may result. Towing — Do NOT tow your vehicle from the rear with any Extang tonneau cover on your truck. The warranty applies to the original consumer/purchaser. Warranty registration must be on file and/or proof of original purchase (detailed and dated receipt) required for warranty to be effective. Warranty coverage starts from the date of purchase. PERFORMANCE: Provided all warranty conditions are met, Extang will either repair or replace (at Extang's option) the product or component. Extang may require the original item to be returned postage prepaid for final determination. Extang reserves the right to substitute and offer the respective warranty discount on an entire replacement system or provide other remedies than those listed in this warranty for discontinued products or other reasons. A return authorization number must be obtained from our customer service department prior to returning any product. Shipping charges will apply for any repair or replacement. This warranty gives you specific legal rights and you may also have other legal rights which vary from state to state. © 2019 Truck Hero, Inc.